"You can do one of two things when you learn you have contracted a debilitating illness: waste energy cursing the world or fight back. Elizabeth Yarnell is among those fighting back." » It began two weeks before Elizabeth’s 30th birthday, when she woke up one morning and couldn’t see out of one eye. That evening she was diagnosed with Multiple Sclerosis. She quickly learned that MS, a degenerative neurologic disease in which the body attacks its own nervous system, currently affects about 350,000 Americans and that approximately 2/3 of those diagnosed with MS are women. It is an incurable autoimmune disease. Because Multiple Sclerosis is a “snowflake disease”, where each person has a unique experience, Elizabeth felt that the only way she could fight it was through controlling what little she could, which amounted to what she chose to put in her body. Elizabeth began studying the connection between diet and nutrition and how that affected health. The research made her a believer in the value of striving for a diet of whole, unprocessed foods that would supply her body with the nutrition it needed to be healthy and fight the disease. The only problem was that she had spent her twenties eating on the run, eating out, or subsisting on gummy bears rather than learning how to cook. She didn’t know how to prepare very many foods in nutritious ways. And then there was the fatigue. Fatigue is common among MS patients, and the fatigue meant that if Elizabeth had to spend hours in the kitchen preparing wholesome foods, and then another marathon session cleaning up the kitchen after dinner, it just wasn’t going to happen. She needed to find a solution that would allow her to eat healthier meals but wouldn’t exhaust her in the process. Then she and her new husband receive an enameled cast iron Dutch oven as a wedding gift. They thought it was adorable, but had no idea what to use it for. Until they found inspiration in a late night infomercial for a countertop appliance used to create one-pot meals with a grate system. Inspiration struck and they invented Glorious One-Pot Meals, an easy way to use whole foods to make healthy and convenient dinners in a Dutch oven. There are so many unique aspects to this cooking method – it accepts fresh or frozen foods without thawing, most dishes take fewer than 20 minutes to prepare, every ingredient is substitutable, it adapts to any dietary needs or preferences, it offers an easy way to increase your intake of vegetables – that Elizabeth felt compelled to share it and teach others how to eat and prepare foods this way. The best way to do that seemed to be through a book. But not just any cookbook; more an instructional manual, a guide to using the Glorious One-Pot Meal technique to become an intuitive, confident chef who can use whatever ingredients may be at hand to make nutritious and delicious meals at a moment’s notice. Fortunately, a decade as a professional instructional designer had trained Elizabeth how to break down a process into steps that she could teach effectively to others. So she wrote a “user manual” that goes beyond introducing a revolutionary cooking technique to offering recipes that take multi-cultural comfort foods and convert them into Glorious One-Pot Meals and even a guide to stocking your freezer, pantry and refrigerator so that this can be a truly quick and convenient way to get a healthy meal on the table. The instructions are clear, concise and understandable enough that even a novice in the kitchen can achieve success. At the same time, the flavors can be complex enough to win over professional food writers. Each recipe is a balance between health, taste and nutrition. Elizabeth began with a 12-page guide that she distributed to family members. It grew into a 25-page booklet given as wedding gifts by 2000. More than fifty agents and publishers turned down the opportunity to publish it over the next 5 years. In the meantime, Elizabeth honed the Glorious One-Pot Meals technique. She applied for and was awarded a patent on the cooking method. She taught cooking classes and gave public cooking demonstrations. 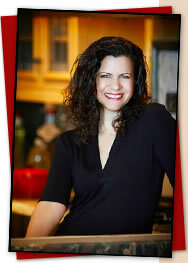 She had two children and received a certification as a Nutritional Consultant (C.N.C.). Finally, in 2005, Elizabeth concluded that if she and her many loyal fans wanted to see the book in print, she would have to do it herself. Elizabeth expanded her existing business, Pomegranate Consulting, LLC, into publishing and the response was immediate and effusive. Released at the end of November, 2005, the first print run of 2,000 books sold in a month. Sales have been steady ever since. Readers write emails along the lines of, “My girlfriend couldn’t stop talking about a cookbook that changed her life,” “You have discovered something truly new in the world of cooking,” "My husband has crowned me gourmet cook ever since I became a one pot meal addict.” and “We tried (your recipe) and my husband couldn't say enough good things about it! It was really easy to prepare and very delicious!” Glorious One-Pot Meals is the newest cooking technique to emerge since the frozen dinner concept arrived in the 1950s and then crockpot cooking swept the nation in the ‘70s. Elizabeth enjoys helping people to eat healthier simply by supplying them with the means to do it. Her goal is to start an epidemic of healthy eating through encouraging people to return to whole foods across our country, not just for MS patients or other sufferers of chronic diseases, but for everyone who is too busy or too overwhelmed to cook from scratch regularly yet still would like to have healthier eating habits.